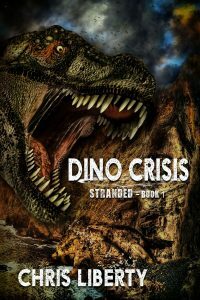 A group of researchers led by Dr. Emmanuel Hernandez gains a permit to visit the quarantined Ilha da Morte to prove either the truth or the fallacy of the whispered rumors of a giant lizard that lurks within the dark, unexplored jungles. One problem after another plagues their mission, starting with their boat sinking during the landing, followed immediately by the loss of their satellite phone and the death of a team member. The expedition, now cut off from the world, takes a more dangerous turn when hooting and roaring in the night reveals not only that the animal they seek is real, but that there’s more than one. And they come closer each night. The creatures soon prove to be the least of the team’s problems after encountering another group intent on keeping the island–and everything on it–secret from the rest of the world, even if they have to kill to accomplish it. Chris Liberty was born in Minnesota in 1972, but lived most of his life in Georgia. He always had a love for creative arts, and was bitten by the artistic bug at a very young age. He discovered his love for writing in his late 20s, writing short stories that he shared with family and friends. His writing preference is paranormal, horror, action adventure, and mystery. Liberty is a “mood” writer, meaning the gloomier the weather, the easier it is to get into the writing mood, especially with a cup of hot black coffee on the table and rain tapping at the windows.